Have you ever wanted to capture a single screenshot of a video? Well, now there is a way. 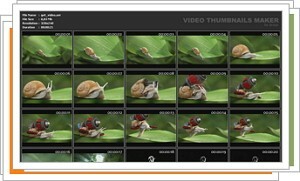 The Video Thumbnails Maker gives users the ability to do just that - make thumbnails and screenshots of supported video files. The advantage of using Video Thumbnails Maker is that it is compatible with nearly every format of video known to man with the proper codecs. It also supports batch processing of video files, which can save you time and effort in a crunch situation. You can manually choose the section of video you want to thumbnail, or the program can do it for you. In addition, you can also save each screenshot as a separate file. With six interface languages, the Video Thumbnails Maker is a great tool for people all over the world who have thumbnail and screenshot needs!